EV Lacertae is a dinky star, a cool red dwarf about 16 light years away. It really is small; its diameter is about 0.4 times that of the Sun, and it’s so faint that if it weren’t one of the closest stars to us we wouldn’t be able to see it at all. Even though it’s a close neighbor, it’s still too faint to see with the naked eye, and is tough even in binoculars. So it’s not very interesting, right? Heh. Bzzzzt. EV Lac is almost fully convective, which means that the heat from hydrogen fusion in its core is transported upwards almost entirely due to hot gas rising. In more massive stars like the Sun, that heat is transported through radiation, literally through light. What this means is that almost all the gas inside EV Lac is moving up and down, rising and falling like water boiling in a pot. The gas is ionized, meaning it has an electric charge. Moving electric charges generate magnetic fields, so little red dwarfs like EV Lac can have pretty strong magnetic fields. EV Lac is also rapid rotator; literally, it spins quickly, taking only about 4 days to rotate once (the Sun, for comparison, takes a month). This means the gas inside it doesn’t just rise and fall in beautiful convection cells; it gets twisted up, tangled like a mass of string. But the magnetic fields hold a huge amount of energy. Twisting them up builds that energy, and eventually something’s gotta give. On the surface of the star the field lines suddenly reconnect, and the energy stored inside is released. On April 25, several satellites detected a huge flash of X-rays. WIND was the first, but NASA’s Swift mission picked up on the flare two minutes after it erupted. The flare was so bright that Swift’s UV/Optical Telescope actually shut down to protect itself! The flare continued for eight hours, pouring energy from this tiny star into the cosmos. The energy of the flare was immense, thousands of times more powerful than a normal solar flare on the Sun. To put this in scale, that means that the flare from this tiny red dwarf star was actually more luminous than the Sun. If you had been looking at the right spot in the sky, you would have been able to actually see the normally invisible red dwarf, it got so much brighter than usual. This is the brightest flare ever seen from EV Lac, even though it’s been monitored for a long time — it’s a known flare source, blasting them out all the time, but none has ever been detected like this one. For astronomers, it’s a boon. EV Lac is young (less than half a billion years old) which gives us insight into how stars behave when they’re still fresh off the vine. It’s a testbed for models of magnetically active stars, and bright flares are good for pushing the limits of both what the star can do and how our physics can model them. Plus, it’s just cool. A flare this big on the Sun — which, as far was we know, is currently impossible — would do some major hurt on the Earth. It would blast away our ozone layer, fry our satellites, create electromagnetic pulses that would take down our power grids and wipe out electronics, and cause all sorts of havoc on Earth… and maybe even a mass extinction*. Mind you, the Sun can’t put out flares like the one from EV Lac, because the Sun is in middle age and has a more settled magnetic field (despite sometimes acting up). 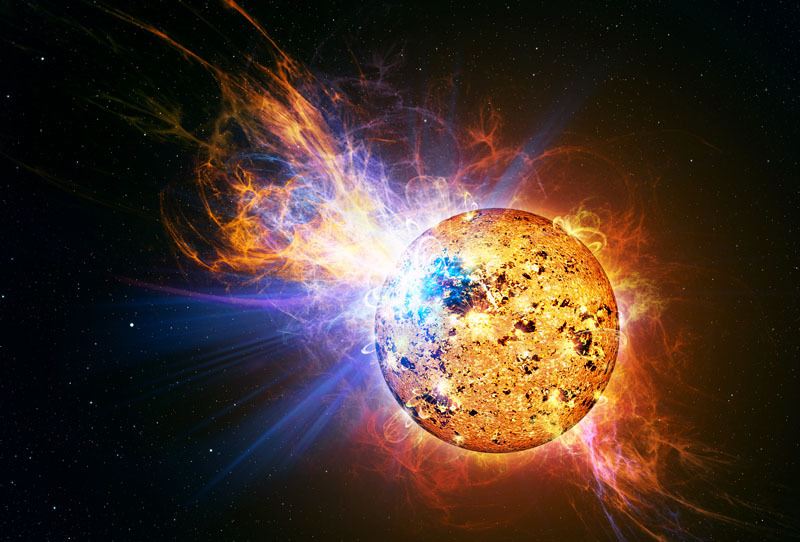 But when it was younger flares like that may have been common, sending out particle and electromagnetic radiation which slammed into the planets. Studying stars like EV Lac give us a handle on what our own star was like back in its raucous youth. *… so of course this is a topic of a chapter in my upcoming book, Death from the Skies!